October 7, 2018, 10 a.m. to 4 p.m.
Elsa Sjunneson-Henry is a deafblind speculative fiction writer and editor. She is the Managing Editor of Fireside Magazine, and the Guest Co-Editor in Chief of Disabled People Destroy Science Fiction. 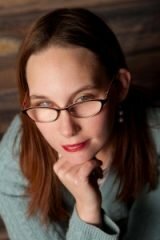 Her work on disability, both fiction and non-fiction has appeared in the Boston Globe, Uncanny Magazine, Fireside, tor.com and many other places. She has a Master’s in Women’s History from Sarah Lawrence College, and is deeply involved in activism as a disabled person. She was raised in Seattle, WA and now resides in New Jersey where everything is terribly flat. This workshop is available to anyone aged 18 or older for a $150 fee. It begins at 10 a.m. and ends at 4 p.m., and students should plan to arrive by 9:45 a.m.
All One-Day Workshops take place in Seattle’s University District, in an accessible building near many bus routes. If you have questions about the accessibility of the workshop location, format, or content, please contact oneday@clarionwest.org.